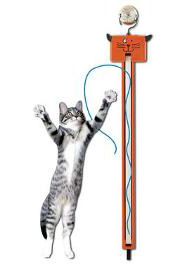 Fling-Ama-String Keeps Your Kitty Entertained | OhGizmo! I have a small black cat which I love very much, however, over the last month or so she has been driving me nuts. No, she’s not in heat, she’s just turning into a spaz. Seriously, she attacks everything that moves (and quite a few things that don’t). This of course includes my feet while I’m running up the stairs, which has nearly caused me to fall and break my leg a few times. Perhaps I need to invest in one of these Fling-Ama-String contraptions. Essentially what you have here is a device that dangles a ribbon in front of your cat, which they will no doubt go crazy for. Just pop in 3 AA batteries and hang it from any door knob. You can select high or low, then watch your cat bat at it for a while. The only issue is that most cats aren’t entertained by a single object for more than a few minutes, so it’s a toss-up whether or not they’ll actually play with this $30 gadget any more than your shoelaces.